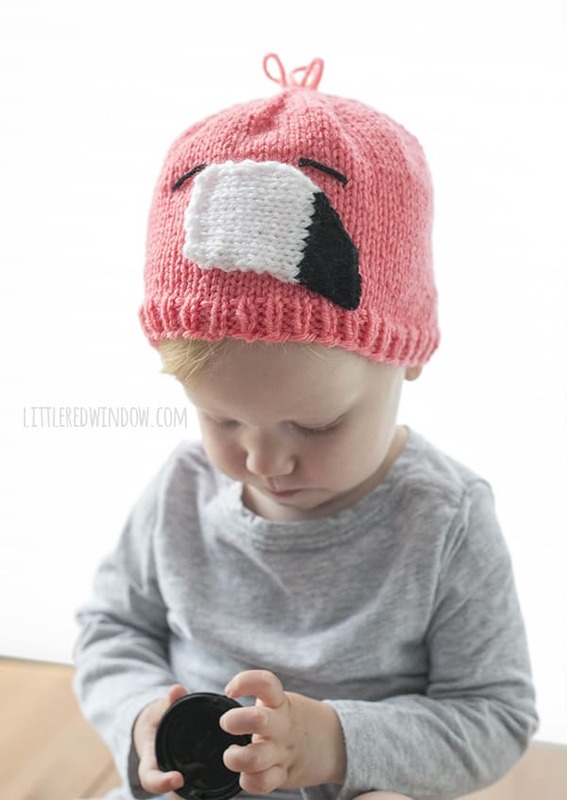 Fun little pink flamingo hat knitting pattern for your newborn, baby or toddler! 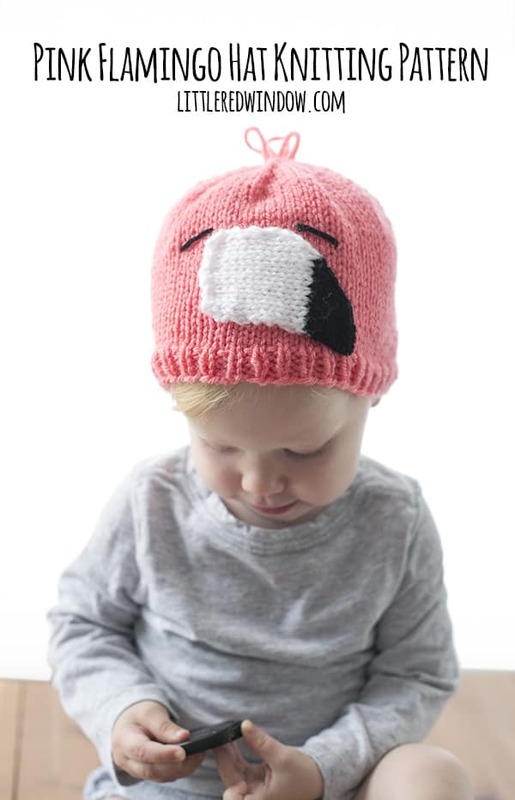 I mean, really, does it cuter than a pink flamingo hat?! Baby V is at that age where she’s talking a ton but she still says things in adorable way and mostly I’m the only one who understands her. I love that stage. I can’t tell you how many times a day I laugh at something she says. Yesterday it was, “I turning kid. NOT a baby!” Ha! And she loves all animals. The other day she was wearing a pink flamingo t-shirt that someone brought her back as a souvenir from Florida and so she learned how to say, “‘amingo!” So darn, cute! Does that look like the face of a toddler willing to stand on one leg for photos? Yeah, not going to happen, Mom. You’re lucky I’m sitting here playing with your camera lens cap at all. 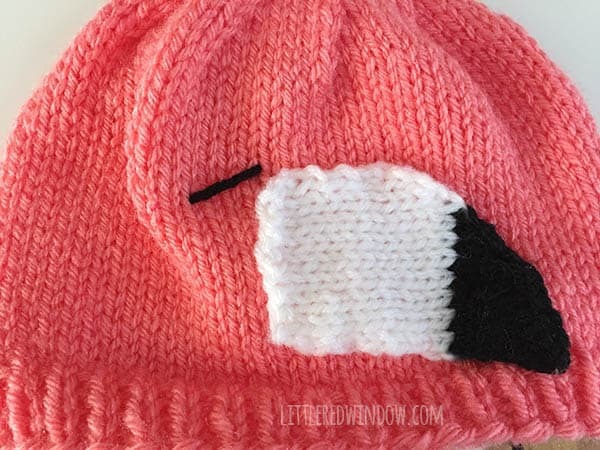 Anyway, it seemed like a pink flamingo hat knitting pattern was in order. You know, the other day I read one of those clickbait-y “Facts you won’t believe!” articles and learned that are apparently more pink plastic lawn flamingos in the world than actual real bird flamingos. By a lot. 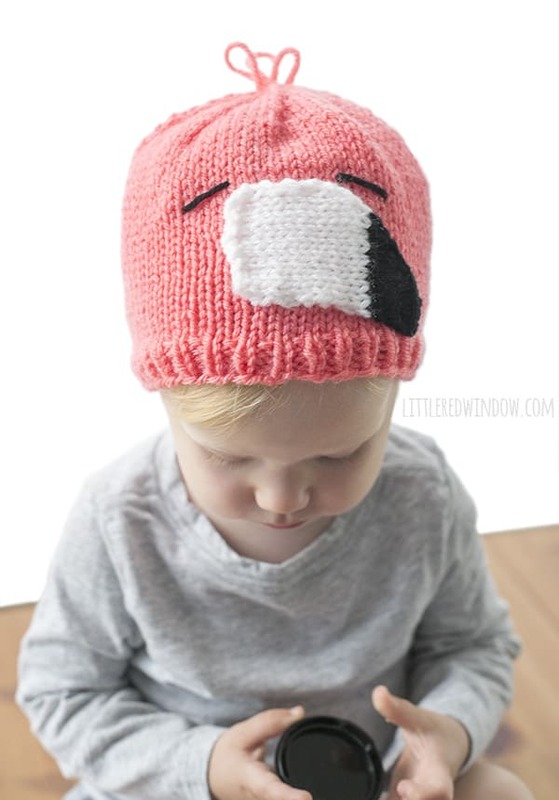 This cute flamingo hat won’t really even the score, but it sure is fun! 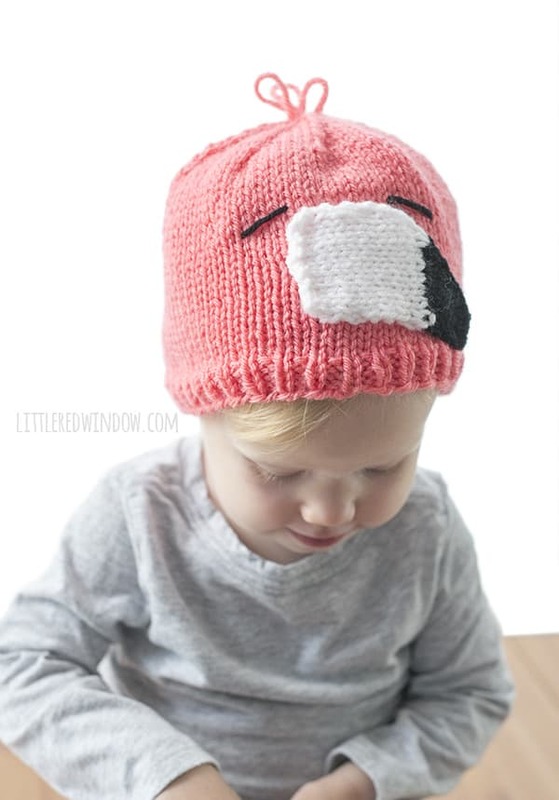 Using long-tail cast on, cast on 72 stitches onto your circular needles with the flamingo pink color. Join to knit in the round and knit 2 stitches, purl 2 stitches in a rib stitch for 10 rounds. Then switch to the red yarn and knit all rounds until the hat is about 5 inches long. Round 6: Knit all stitches to the end of the round. Cut yarn, pull through loops and close. Weave in ends. Using double pointed needles as straight needles, cast on 10 stitches with white yarn. Leave a long tail to stitch the beak to the hat. Cast off, cut yarn and pull through loop to close. 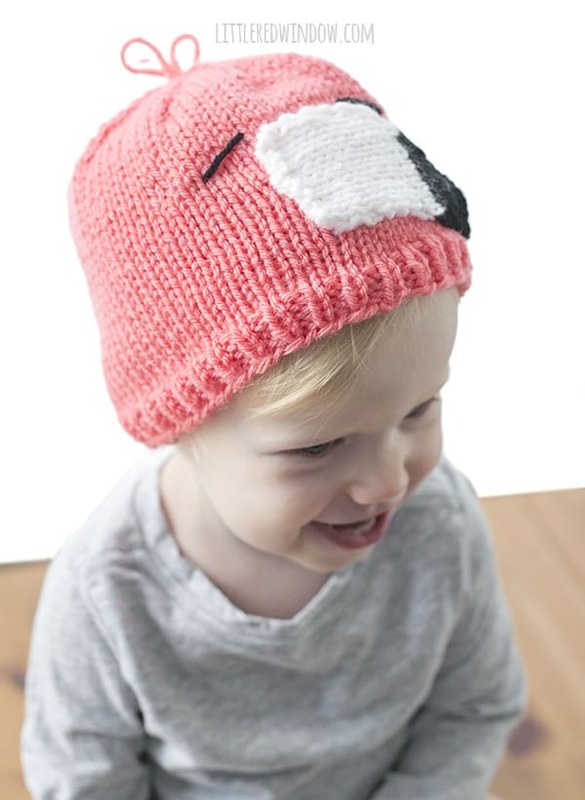 Use the tails to stitch the beak to the hat. Thread a length of black yarn on your yarn needle and make two horizonal stitches for the eyes. 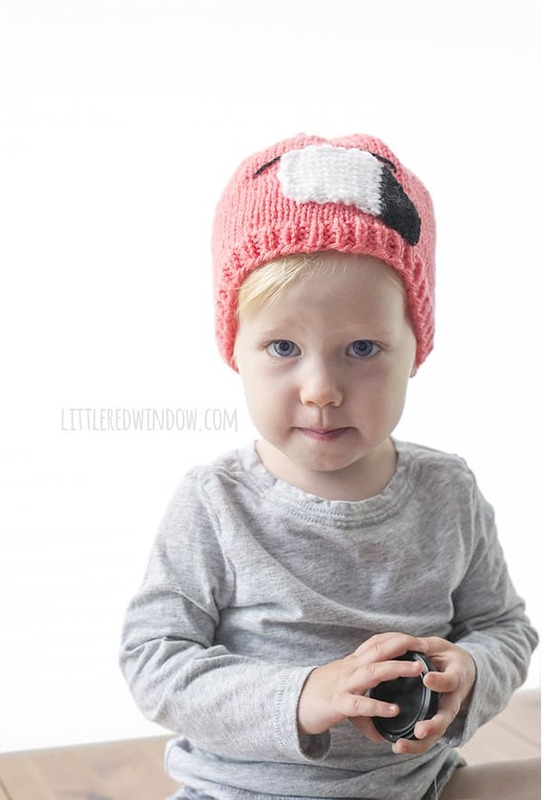 Make sure these stitches are fairly loose so they don’t pull when the hat stretches. 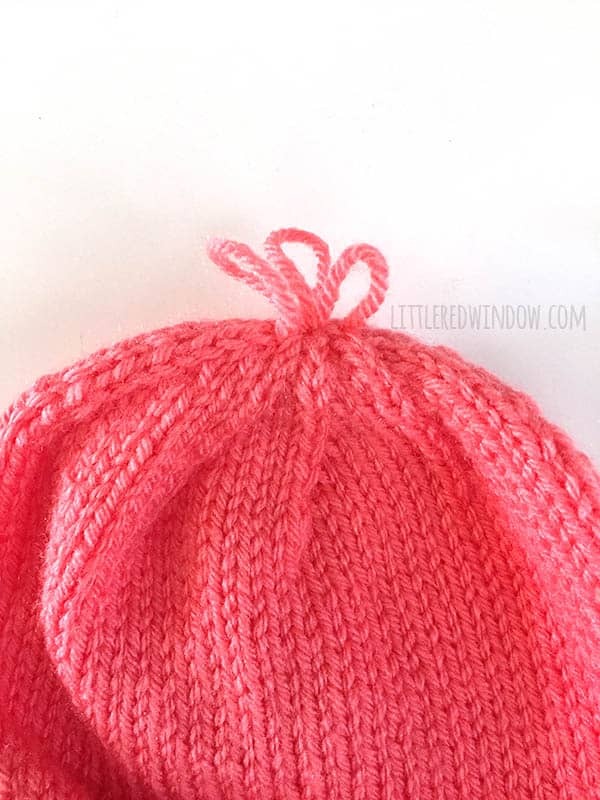 Finally take a length of pink yarn on your needle, knot it inside the top of the hat and sew three little loops for the hair, knot between each one to anchor the loops. Knot again on the inside and weave in all ends.